Analog Devices DC2527A-B Demonstration Board evaluates the performance of their LTM4646 dual 10A or single 20A high-efficiency, switch mode step-down power μModule Regulator. 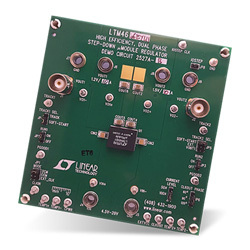 The board includes Demonstration Circuit 2527A-B with the LTM4646EY μModule Regulator. The device functions with a broad input voltage range of 4.5V to 20V and an output voltage of 0.6V to 5.5V. With CPWR bias, the input voltage can be as low as 2.375V. The board also supports de-rating, as required for certain VIN, VOUT, frequency and thermal conditions. The TRACK/SS pin enables the creator to program output tracking or soft-start period. The board works in continuous conduction mode in heavy load conditions. For high efficiency at low-load currents, creators can use the MODE_PLLIN jumper to select discontinuous conduction mode. Also, the MODE_PLLIN pin also enables the regulator to synchronise to an external clock signal between 300kHz and 1.3MHz. Using the board, the designer has the choice of choosing both internal and external compensation circuit for the μModule Regulator.